Complete dentures can be either “conventional” or “immediate.” a conventional denture is ready for placement in the mouth about 8 to 12 weeks after the teeth have been removed or to fabricate new dentures. Unlike conventional dentures, immediate dentures are made in advance and can be inserted as soon as the teeth are removed. This allows the patient to have the surgical procedure to remove the teeth and walk out with an excellent smile. However, bones and gums shrink over time, especially during the healing period following tooth removal. Therefore a disadvantage of immediate dentures compared with conventional dentures is that they require more adjustments to fit properly during the healing process and generally should only be considered a temporary solution until conventional dentures can be made. A removable partial denture consists of replacement teeth attached to a pink or gum-colored plastic base, which is connected by metal framework that holds the denture in place in the mouth. Partial dentures are used when one or more natural teeth remain in the upper or lower jaw. There are also removable partial without metal. 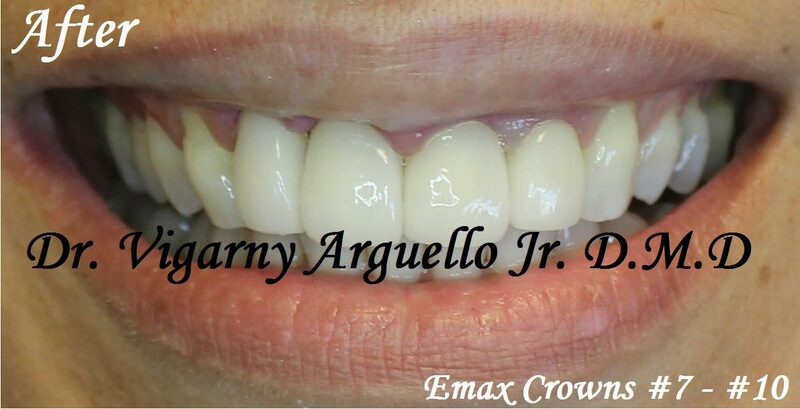 A fixed (permanent) bridge (link to bridges and crowns) replaces one or more teeth by placing crowns on the teeth on either side of the space and attaching artificial teeth to them. This “bridge” is then cemented into place. Not only does a partial denture fill in the spaces created by missing teeth, it prevents other teeth from changing position. A precision partial denture is removable and has internal attachments rather than clasps that attach to the adjacent crowns. This is a more natural-looking appliance. The denture development process takes about three weeks to 1.5 months and several appointments. Once your dentist or prosthodontist (a dentist who specializes in the restoration and replacement of teeth) determines what type of appliance is best for you, the general steps are to: Make a series of impressions of your jaw and take measurements of how your jaws relate to one another and how much space is between them. Create models, wax forms, and/or plastic patterns in the exact shape and position of the denture to be made. You will “try in” this model several times and the denture will be assessed for color, shape, and fit before the final denture is cast. Cast a final denture Adjustments will be made as necessary. If your dentures “click” while you’re talking, you should contact your dentist. Your dentures may occasionally slip when you laugh, cough, or smile. Reposition the dentures by gently biting down and swallowing. If any speaking problem persists, consult your dentist or prosthodontist. When it is used as a “fix” for ill-fitting or poorly constructed dentures. If your dentures begin to feel loose, cause discomfort or cause sores to develop, contact your dentist as soon as possible. When a dentist has not evaluated your dentures for a long time. Dentures rest on gum tissue and your jawbone, which shrink and deteriorate, respectively, over time. Therefore, the real problem might be a need for a denture adjustment or new dentures. When oral hygiene practices cannot be sustained. Use the minimum amount necessary to provide the maximum benefit. Apply less than you think you need, and then gradually increase the amount until you feel comfortable. Distribute the adhesive evenly on the tissue bearing surface of the denture. Apply or reapply when necessary to provide the desired effect. Always apply the adhesive to a thoroughly clean denture. Remember adhesives work best with a well-fitting denture. Paste application. Apply this denture adhesive to a dry or preferably wet denture. Avoid placing adhesive close to the denture borders. If the adhesive oozes, use less of the product. For dentures on the upper jaw, apply three short strips of adhesive-or s series of small dots-along the ridge area and one down the center. For dentures on the lower jaw, apply three short strips of adhesive-or s series of small dots-in the center of the ridge area.